In 2015, a revolution took place at the Old Vic. Under newly appointed artistic director Matthew Warchus, we completely changed the way the theatre programmes work. This was a necessary response to the central question that had to be addressed when Matthew took over from Kevin Spacey as artistic director: how to ensure the survival of the Old Vic as a producing house – and why it is important that it does survive. 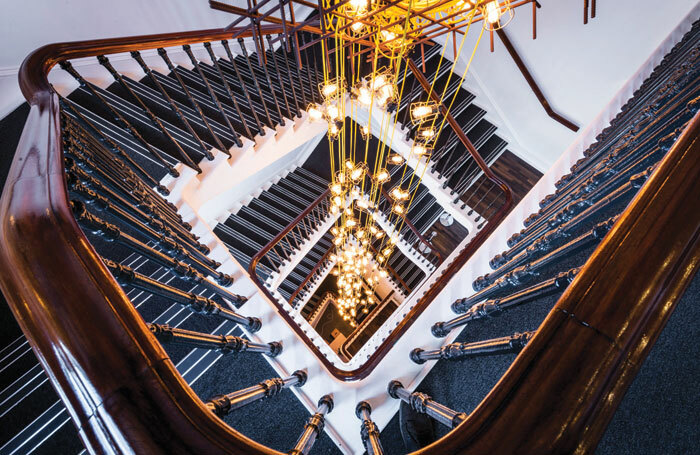 The Old Vic is arguably one of London’s most beloved venues, but it is a theatre with a surprisingly vague and imprecise identity – a noticeable exception being 13 years as home to the National Theatre in the 1960s. Historically, it has failed to compete with the West End as a receiving house, due to its Off-West End location. And as a producing theatre operating without subsidy, it has bankrupted 13 successive owners. Roll back to the last time the theatre was up for sale in 1998, and there were three possible purchasers: a lap-dancing club, a bingo hall, or a theatre. A collection of philanthropists, led by Sally Greene, donated the funds needed to outbid the competition, purchase the building, and place it into the charitable trust through which it operates today. This gutsy act is reflective of the risk-taking and daring spirit that has propelled this theatre forward during its history, much more so than the glamour and red-velvet grandeur for which it often gets remembered. After the charitable trust was established, the Old Vic found a way to break even, with Spacey, a Hollywood star, leading as artistic director. His 11 years at the helm put the theatre firmly back on the map, kept it in the media spotlight and ensured that each season balanced financially when he performed in a sell-out show. Warchus, Spacey’s associate, had an enviable profile for the role as his successor. But as an award-winning director rather than actor-manager, he had different attributes to bring and ambitions for the role. 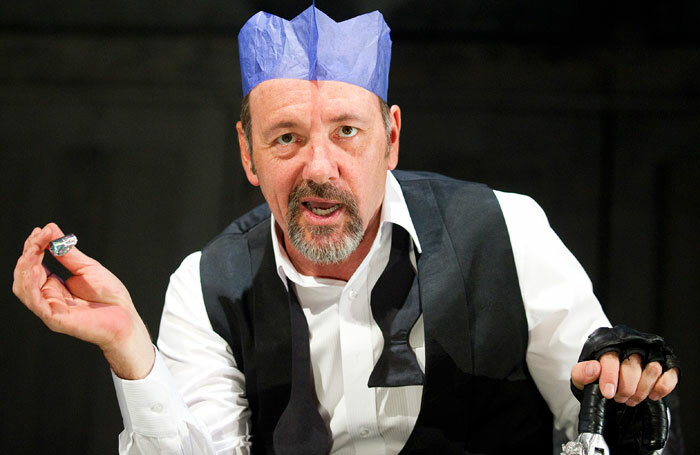 With no change in the Arts Council’s policy for the Old Vic (generous one-off matched funding support for our endowment but no regular subsidy to be had), we needed to devise a way of working that didn’t rely on either a subsidy or the star power supplied by Spacey. What producing model would allow the Old Vic, a £13 million turnover break-even business, to continue generating its own work, and to stay solvent? Properly addressing this question felt like yet another pivotal moment in the history of this great building, particularly given the constrained funding climate in which all theatres now operate. We distilled the question down into the following challenge: redefine the relevance of the Old Vic within the theatre landscape, and encourage audience diversity and loyalty. The latter was eminently possible because of our size. With 1,000 seats to sell each night, the Old Vic has had a historic average annual capacity of around 62%. This gave us a huge opportunity to retain and grow the loyalty of our existing audience, but also to welcome a swathe of new theatregoers into our building. To achieve this influx, we needed to produce more content (and more varied content) at a price that people could afford to pay, in a place where they felt welcome. This involved a number of changes being made. An initial capital spend on the building was required, which we were able to fund through our restoration levy. This allowed us to change the look and feel of the front-of-house areas, and to modernise the Old Vic’s brand. Second, we needed to create an open-access, affordable ticket scheme. We were fortunate to have an existing strong relationship with PricewaterhouseCoopers, which was receptive to shifting its existing under-25s ticket scheme to one that was not limited by age, or geography, or demographic, but was for everyone. In 18 months, the PwC £10 Previews scheme has provided almost 27,000 £10 tickets, 64% of which are new audiences to the theatre. Third, we needed to change our programming structure. Royal Bank of Canada came on board in September 2015 as our principal partner, its seminal support enabling us to double the amount of work produced in any one season. 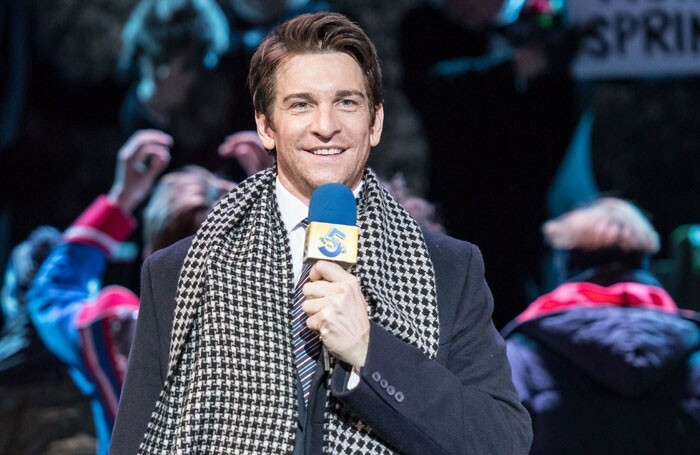 It has resulted in an uplift of 10% in audience capacity since the start of Matthew’s tenure, and leveraged further potential for fundraising due to an expanded programme and opportunities for engagement. 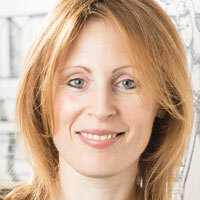 Fourth, we needed to work more in partnership to offset risk and to deepen our relationships with commercial producers to contribute to our more ambitious productions (in particular large plays and musicals), and broker new co-commissioning and co-producing partnerships in the subsidised sector to support our more risk-taking work. And with both, to plan transfers and tours of the work to optimise future income streams. Thanks to these changes, the ‘new’ Old Vic already looks very different. The number of productions per season has doubled. Matthew has diversified the artistic programme, offering in each season an eclectic mix of new writing, musicals, dance, family work, arthouse plays, and classic revivals with a twist. Daytime family work and late-night music, magic and comedy have beenadded into the mix to further broaden the offer. We are now commissioning and programming new plays, musicals and dance. A group of associate artists, Matthew’s peers in other creative disciplines, works with him across the theatre not only to create their own work but also to mentor and inspire the next generation of talent. We have continued to run existing – and developed new – programmes to educate and enthuse schoolchildren and students, and to engage our local community. Our PwC £10 Previews ticket scheme opens our doors to those who couldn’t previously afford it. And our cafe and bars provide places to meet in the foyer that is light and inviting. That’s not to mention the red neon wording across the entrance, “Dare always dare”, the words the great Lilian Baylis hung over her desk when she ran the Old Vic in 1912. It is a rallying call to adventure, to inspire the artists and creatives who work at the Old Vic as well as the incoming audience. It tells them who we are, where we are coming from and what we aspire to. But, of course, it is also an invitation to come on the adventure with us. • Are independent – not privately owned, not commercial, with no government mandate. • Are a charity – we have a revenue fundraising target of £3.5 million a year to break even and no subsidy. • Produce our own content – we programme six to eight shows a year on our main stage. • Commission work – presenting world premieres not only adds to the canon but can bring future income in return for taking a chance on something new. • Open all hours – there’s daytime family programming; late night comedy; music and magic shows; Voices Off, a series of talks, debates and conversations; and a daytime cafe, cocktails post-show, and a late-night bar. • Are part of our community – we work with schools and colleges to educate and inspire, with emerging talent to provide opportunity, and we partner with other theatres to make ambitious work. • Share our work – transfers, tours, digital exploration, social media, live broadcast. • Have space for more – across a season we have 60,000 available seats that we still want to fill. A great deal has been achieved in the last 18 months. Our average audience capacity in the main house has increased by 10% (within this is a 4% uplift on financial capacity to 66%). The take-up for our newly launched series Voices Off has been strong, with nearly 3,000 attendees in 2016. We have engaged more people off stage, with 10,000 adults and young people attending our community, education and talent programmes. Two productions that began at the Old Vic have had a further life in New York – The Hairy Ape at the Armory in March 2017, and Groundhog Day (which won two Oliviers) opened on Broadway in April 2017. 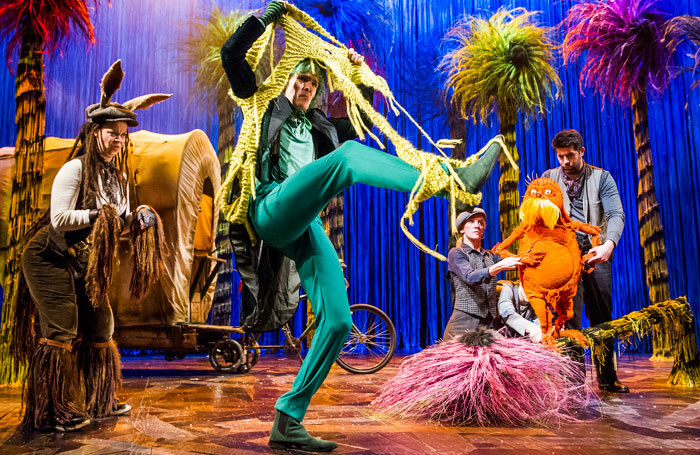 Our Olivier-nominated family production of Dr Seuss’ The Lorax transfers to Canada for Christmas 2017, and then on to Minneapolis and San Diego, Samuel Beckett’s No’s Knife conceived and performed by Lisa Dwan will play at the Abbey Theatre this June, and there is a tour for Art planned for 2018. Our reach has further extended with the current production of Rosencrantz and Guildenstern Are Dead being transmitted to cinemas last week with our first NT Live. And nearly 200,000 people now followed us on social media, an increase of 25%. Across the organisation, fundraising income has increased by 15%. In April 2016, we launched a new brand, working with internationally renowned branding agency Pentagram to mark a new beginning for the Old Vic. Matthew’s vision is that the Old Vic provides an unintimidating, accessible gateway into theatre. A chance for audiences and creatives alike to try anything once and discover something new or different in a place that has made theatrical history for nearly 200 years and continues to do so. A theatre that is full, day and night. A place where a wider range of people can come to entertain new ideas, be entertained, and enjoy the vast emotional, social, political, spiritual and cultural benefits that theatre can bring. With this vision, and the new model that underpins it in place, our next challenge is upgrading the building to make it fit for our 21st-century audience and the world-class creatives we want to attract. But for today, the Old Vic looks forward to its 200th year of rule-breaking, creatively adventurous theatre in 2018 with the same optimism and irrepressible spirit that has kept it thriving for two centuries. The Editor's View: What is the real root of theatre’s diversity issue?